Enjoy a trip through historic Evanston. See how Davis Street and Sherman and Orrington Avenues appeared around the beginning of the 20th century. Learn how Fountain Square has evolved and how the Merrick Rose Garden is connected. 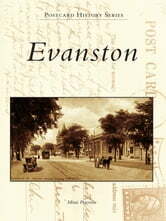 See Northwestern University as it was founded, along with early Evanston�s lakefront, city hall, library, and post office. Many of the buildings shown in this book are still standing, while others have been demolished. In some postcard views the stately elm trees of later decades are seen as saplings. The Library Plaza Hotel, North Shore Hotel, and Georgian Hotel are here as well, along with the historic schools, churches, train depots, and, of course, Grosse Point Lighthouse, which all helped shape the city in its formative years.